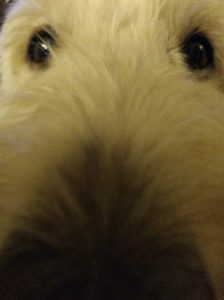 Does my nose look big when I get too close to the camera? I’m trying to get as close to you as I can! Do you know why? Because I miss you!!! Dad says it not quite as warm in Wisconsin as it is here in Arizona. Today it was 85 degrees (whatever that means). All I know is that Mom had us cut short so that we wouldn’t be panting all the time. (What’s wrong with panting?) I hope I don’t have to wear a jacket when I get back to Wisconsin. Well, Sarah is playing with my toy, so I gotta go. You let someone be the Alpha dog and suddenly they think they’re in charge!